I give this movie slack because it legitimately makes me laugh but don’t get me wrong, it’s an AWFUL adaptation. This isn't a kids movie, it's a bad parody of one! One of the foremost horror performances of our time, Mike Myers unintentionally creates something so universally creepy and terrifying that I still sometimes I have nightmares about it to this day. Really bizarre live-action adaptation of the book, and not in a good way either. An outright terribly film in most regards. They at least put some effort in with regards to using some real props and a cat suit vs a cgi cat, but that does not save this from the mess that it is. Mike Myers still inspires a few chuckles. Probably despite yourself. 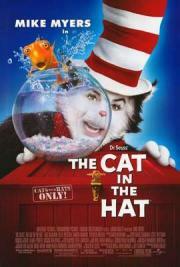 However whatever made The Cat In The Hat such a famous and timeless story is ever not at all present in this cheap cash grab studio adaptation. Why is this so horny? Pretty sure the original text didn't have multiple mentions of testicles, for one thing. The weird production design gives it all 36 points.